We’d love your help. 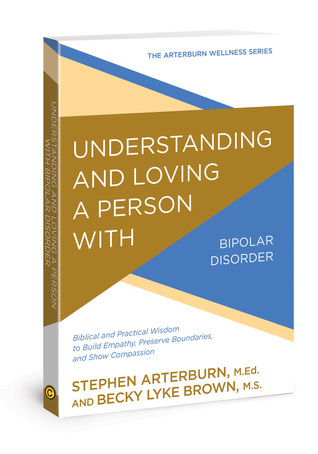 Let us know what’s wrong with this preview of Understanding and Loving a Person with Bipolar Disorder by Stephen Arterburn. To ask other readers questions about Understanding and Loving a Person with Bipolar Disorder, please sign up. Stephen Arterburn is the founder and chairman of New Life Ministries—the nation's largest faith-based broadcast, counseling, and treatment ministry—and is the host of the nationally syndicated New Life Live! daily radio program aired on over 180 radio stations nationwide, Sirius XM radio, and on television. Steve is also the founder of the Women of Faith conferences, attended by over 4 million wom Stephen Arterburn is the founder and chairman of New Life Ministries—the nation's largest faith-based broadcast, counseling, and treatment ministry—and is the host of the nationally syndicated New Life Live! daily radio program aired on over 180 radio stations nationwide, Sirius XM radio, and on television. Steve is also the founder of the Women of Faith conferences, attended by over 4 million women, and of HisMatchforMe.com. Steve is a nationally known public speaker and has been featured in national media venues such as Oprah, Inside Edition, Good Morning America, CNN Live, the New York Times, USA Today, and US News & World Report. In August 2000, Steve was inducted into the National Speakers Association's Hall of Fame. A bestselling author, Steve has written more than one hundred books, including the popular Every Man's series and his most recent book, Healing Is a Choice. He is a Gold Medallion–winning author and has been nominated for numerous other writing awards. Steve has degrees from Baylor University and the University of North Texas as well as two honorary doctorate degrees. Steve is a teaching pastor at Northview Church in suburban Indianapolis and resides with his family in Indiana.